Jordan Peterson accuses the government of preying on the weak, those who can easily become addicted to gambling and thus provide revenue for government coffers. In the meantime, gambling exacts an untold price upon the health of society. The government in Canada thus plays the role of organized crime in administering a vice that makes victims of the weak. We see from this that we should not look upon the government as a benevolent entity, but as a threat to our well-being. Similarly, the IRS and compliance condors prey on the weak. On Dec 15, 2012, at the FATCA Forum organized by John Richardson, I argued that the Canadian government’s stance, that it would not collect FBAR fines, meant that those of us affected by the threat of the IRS draconian FBAR fines would have to stand up for ourselves–we had to be Clint Eastwoods–and that left the IRS to prey upon the weak and vulnerable residents of Canada who feared what the IRS could do to them if they failed to enter the OVDP/OVDI, i.e., the last, best chance for people to get right with God. When innocent benign actors (the non-Clint Eastwoods) entered the ODVP, the IRS exacted many LCU (“life credit units”) and made their lives hell. Remember to gamble responsibly. That’s the government’s message. And when it comes to the IRS, you are on your own. It is now 2019, and it’s been eight full years since I was a USA citizen. My date of relinquishment was 28 February 2011, but the IRS thinks erroneously that my date of relinqhishment was 7 April 2011. That means its been over six years since I last filed taxes and the statute of limitations for the IRS challenge my tax returns has expired, at least according to criminal law. However, if the IRS wished to claim that there is fraud on my tax returns and to attack me according to civil law, there is no statute of limitations. In the case that one of the three exceptions does apply, the IRS has an unlimited amount of time to audit and charge penalties and interest. 3. The Taxpayer Failed to file a tax return. Of course if you are a Democrat candidate for President of the USA, fraud is not really a problem. 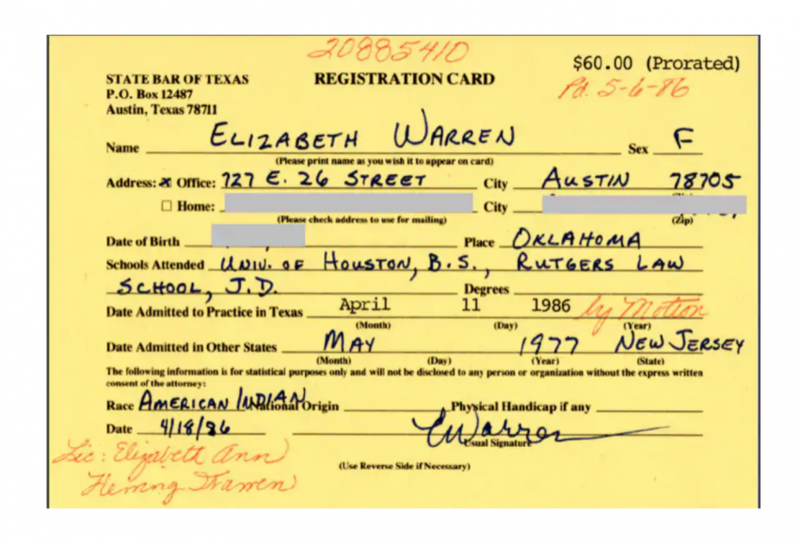 Consider Elizabeth Warren’s attempt to pass herself off as American Indian minority, which circumstantial evidence shows that it helped to land a well-paying academic post at Harvard Law School. She had no more proof of her minority status than family anecdote and high cheek bones. Academic cheating is a serious enough problem that armed Federal Agents went to the home of Felicity Huffman, hand-cuffed her and took her into custody. So if you use the mail system (mail fraud) to bribe your child into Harvard or Yale, you get roughshod treatment from the FBI, but if you use fraud (and the mail system) to get a position at Harvard, you can become a Democrat candidate for POTUS. Do former Americans regret renouncing their citizenship of a country where they are constantly threatened with jail time while their politicians get away with fraud? John Richardson says, “They almost all “regret” that U.S. laws have forced them to renounce U.S. citizenship (they wish they could have remained citizens of the country of their birth); but [t]hey NEVER feel that they made the wrong decision.” I think that Mr. Richardson must have spoken with me and a few other Brockers before he wrote that. Republicans Overseas is hosting an event, with House bill co-sponsor Congressman George Holding, Solomon Yue and John Richardson on the Taxation Fairness for Americans Abroad Act bill, London, England, 24 April 2019. “There is a bill to fix citizenship-based taxation for Americans! Come learn all about it from its sponsor, Representative George Holding! Full details and registration at the EventBrite site. The above tweet links to the a report from the Government Accountability office. It is extensive but generally interesting. A quick perusal reveals no evidence that the Government views FATCA and foreign asset reporting as tools to enforce worldwide taxation on people who live outside the United States. Yet, that is the purpose of FATCA and foreign asset reporting in general. There has been a lot of dissatisfaction expressed in recent months, on the site and in e-mails to the moderators, regarding irrelevant/off-topic comments. It’s also important that Brock provides a place for people to express their thoughts. To strike a balance, we have installed a “move comment” function, with which we can move a comment to a different thread. This should help keep things more focused while, at the same time, the person’s comment still appears on the site and discussion can ensue without overwhelming the original, unrelated, thread. Moving a comment from one thread to another keeps both threads more useful to persons seeking help or information or simply having a coherent discussion on a topic. We do not intend to eliminate thread drift from the site, just to keep certain threads focused, such as a post that deals with a project or a post focused on a specific type of information but someone posts a comment way off-topic; say, consulate problems on the FATCA thread. Many topics overlap a lot, so don’t expect perfection — and every one of us undoubtedly has a different sense of just where “on-topic” ends and “off-topic” begins (can’t please everyone all of the time), so you may still see some comments you feel are out of place but to a lesser degree. Thread drift is inevitable on a site that values sharing of ideas and opinions. It can be pesky and annoying, but sometimes it’s a good thing which expands discussion; and exchanging thoughts is important part of the Brock community. We don’t want to quench that! But this should keep parts of the site on target. “The New York State Department of Financial Services has initiated an investigation into Swedbank, according to a document presented to Swedish Television, SVT. The suspicions relate to misleading information in connection with the DFS demanding an answer from Swedbank about the notorious law firm Mossack Fonseca. SVT has revealed that the Swedish banking giant Swedbank’s top management withheld information on suspect customers and transactions from US investigators. … “DFS demands that Swedbank submit extensive documentation regarding business relations with Danske Bank. This involves transactions, customer information and notifications made to authorities, as well as all possible external and internal investigations that in some way may affect Danske Bank. Swedbank has also been requested to provide equally extensive information on their business relations with three other banks that all have been involved in large-scale money laundering scandals: Ukio Bankas, ABLV and FBME. The New York authorities delivered the “request” to the New York local branch, and asked for a global answer. The Swedish public is aghast that the Swedish bank operating in Europe would not have provided full criminal evidence to the U.S. legal agency. The whole affair is related to the now-closed Mueller investigation, previously-prosecuted Manafort FBAR conviction, and the long-ago Soros/US-Aid funded Panama Papers affair. It seems that the bank was “caught” handling Manafort-related bank transfers…….this despite the fact that Manafort was not convicted of money laundering–He got caught with FBAR violations, bank fraud, and tax cheating. It also alleges that payments were sent by Swedbank to companies (including Manafort’s in the Caribbean. Never mind that many Swedish companies’ parent and daughter companies and ships are also registered there, and that global transactions go back and forth all the time. In these stories, the bank transfers are summarized as “money laundering” although there is no crime to launder. So, when a U.S. legal agency “requests” information about any European transactions of anybody including any American, the Swedish media, authorities, bank officers, and public will all spank themselves if they don’t hand it over. So much for those European constitutions and all that innocent-til-proven guilty stuff they’ve got written in there. Sweden had once held a spark of FATCA resistance, reversed itself, til it finally celebrated its FATCA surrender. Crying is now long over. As a result of it all, Swedbank stock tanked (did Soros short Swedbank stocks too?) and depositors are jittery. The Obama administration & the DopeState had orchestrated a gigantic expat-bashing propaganda campaign to smear expat US citizens, leading up-to the intro of FATCA and continuing through its rollout. ICIJ, the Soros/USAid “Offshore” propaganda outlet, is itself a spiderweb of offshore shell corporations and shady offshore financing. The oldstock Brockers remember the large doses of offshore propaganda brought in by the DopeState partnership of government figures, media outlets, and the Financial Industrial Complex….when expats were daily barraged by FATCAT articles about Offshore Offshore Offshore. (rather than today’s Russia Russia Russia propaganda campaign). Many remember the related hit articles on the revelations of Swiss bank accounts of rich Americans such as Tina Turner (resident and eventual citizen of Switzerland) due to Panama papers and ICIJ(International Consortium of Investigative Journalists). 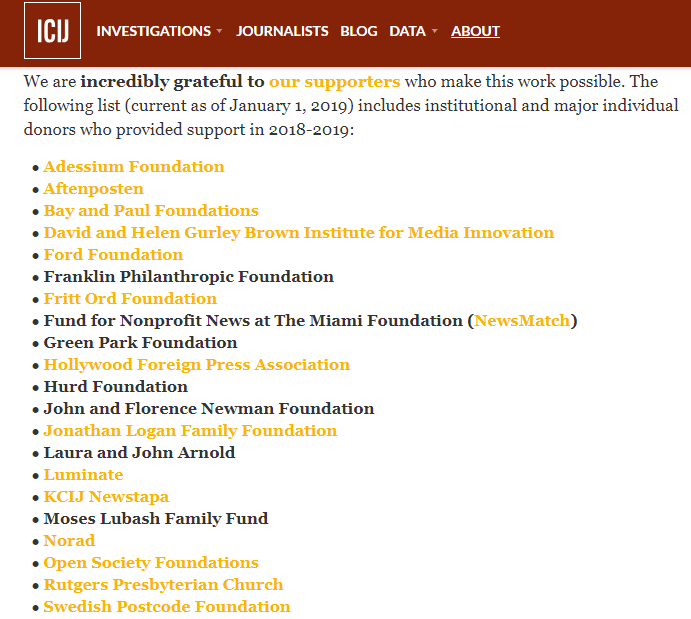 Well, it turns out that the hypocrites of ICIJ (International Consortium of Investigative Journalists) was funded by a spiderweb of Offshore-Shell –Company DopeState actors (including USAid in critical years, but its current donors are listed below). The article below highlights it. “it’s curious that ICIJ’s Pulitzer-winning series featured Putin so many times given that Putin didn’t even have an offshore account with Mossack Fonseca. It’s also curious that so few Americans were exposed by ICIJ. On February 28 2019 John Richardson published a post in TaxConnections entitled: “The USA Of The 21st Century Is Like Britain In The 19th Century”. You can read and contribute to the new post on this link. We’ll be getting together for lunch Saturday, 9 February, at 1:00 pm at Montana’s BBQ Restaurant, 1750 Ogilvie Road. Plenty of free parking on site, also accessible by city bus.